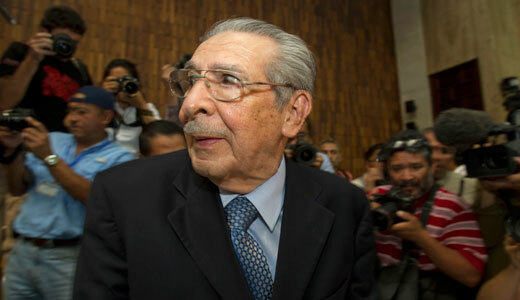 The Guatemalan Constitutional Court on May 20 threw out the guilty verdict of General Efrain Rios-Montt on technical grounds, plunging the whole country into a state of new insecurity. Just 10 days earlier, a Guatemalan court had found the former dictator guilty of genocide and crimes against humanity, and sentenced him to 80 years in prison. 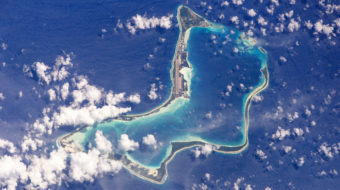 During the original trial, various attempts had been made to stop the proceedings. These attempts we the results of pressure from the country’s far-right business and landholding elites. The current president of Guatemala, General Otto Perez Molina, also has said that during Rios-Montt’s tenure of a year and a bit, in 1982 and 1983, no genocide was committed. The killing of perhaps 40,000 people overall, and the crime for which Rios Montt was convicted, namely the murder 1,771 of people of the Ixil Maya ethnic group in “Operation Sofia”, was not genocide because the women, children and old people who were slaughtered with mind-boggling brutality were assumed to be providing support for the guerillas in the forests and were killed because of this and not because of their ethnicity. Besides, the army unleashed by Rios-Montt on the Ixil Triangle only killed about 5.5 percent of the Ixil population, not enough to be considered genocide. So runs the argument of the defenders of Rios-Montt. It is a revealing one, because it shows that these people think they were justified in killing anybody who agreed with or was in communication with the guerillas, as well as guerillas who were taken prisoner, who were generally massacred by the troops. 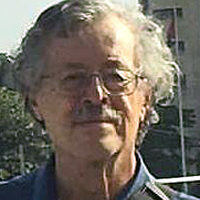 It ignores the “detail” that there would have not been a guerilla insurgency in Guatemala in the first place had it not been for the fact that in 1954, the United States Central Intelligence Agency had overthrown the legally elected government of President Jacobo Arbenz because of the threat his progressive policies represented to the interests of U.S. corporations, especially politically connected United Fruit. After that coup, the United States government continued to support one military, or military dominated, regime after another, and did far less than nothing to help Guatemalans restore democracy. The obvious sadistic racism of the Guatemalan ruling elites and military brass was ignored. In Latin America, military officers who show this kind of attitude are generally referred to as “gorillas,” which is most unfair to the African apes. A lot of people, and not only in Guatemala, had reason to fear the repercussions of the guilty verdict. Many people were saying “who’s next”, and that President Perez Molina’s name came up in the trial, as a lower level officer in Rios-Montt’s forces during the bloodiest period, brought these fears to the highest level of government. The Reagan administration had strongly supported Rios Montt’s bloodbath in the Ixil Triangle, and, although Reagan has gone to his reward, there are discussions both in Guatemala and the United States about which U.S. civil and military officials could and should still be prosecuted for abetting the Rios-Montt genocide. There were many reports of threats of violence to the judge, to the prosecutors and to the witnesses during the trial. Many of the witnesses were older peasants from the Ixil group who showed great courage in testifying in the face of this kind of threat; now they may have to go through the whole thing all over again, and are sure to be subjected to even more intense death threats and other pressure. Rios-Montt’s attorneys are claiming that the whole trial has to be started over again with “new judges”, meaning right wing ones. One of their main complaints against the original trial was that the Judge, Jasmin Barrios, was prejudiced in favor of the prosecution. Right-wing media in Guatemala are hinting that the judiciary is now “communist infiltrated.” It is unclear at this point, however, precisely what will happen next. On a related note, on May 17, former Argentine Dictator Jorge Videla died in prison at age 87. He was also serving a sentence for crimes committed during Argentina’s “dirty war” in the late 1970s and early 1980s. There is a direct relationship with the events in Guatemala; the Argentine dictatorship, as well as the governments off the United States and Israel, had provided “material aid” in the form of equipment, training and advisors to Guatemala’s bloodthirsty rulers.